Enclosed is the Ski Tales Article for our Great Trip to ski in Solden, Austria, for 7 days and then invade Prague for 3 days. Our Trip Leader, Marion Atwater, did a great job keeping us busy, informed and keeping tabs on use through Switzerland, Austria, Germany and the Czech Republic. Send your pictures to me for a group DVD. Solden trip members flew out of Newark airport on Friday, January 20 after the usual beverages at our favorite airport gate restaurants. Many were sporting their green Tyrolean hats. After our overnight flight to Zurich, we cleared customs and met Jim Buonincontri and Fernanda Toker who had traveled in separately. Our bus had an outboard ski rack that made luggage transportation a breeze. Travel to Solden allowed us to catch up on some sleep and we arrived in time for our group’s private reception and orientation meeting. Drinks were provided by Alphorn Tours and a representative from the Solden Tourist Office was on hand to answer all questions. During our first morning in Austria, we discovered the omelette station in the dining room. OMG! Wonderful! Those hitting the slopes enjoyed the Gigi and the Gurgles – that’s MCSC talk for lifts and areas we can’t pronounce. Daily happy hours were rowdy scenes at some bars that included Marco’s, The Mogul and The Grizzly. We sang German songs and belted out the occasional “Sweet Caroline” as only Americans can do. Dinners at the Hotel Tyrol were fabulous! (Average per person weight gain = 3+ pounds). And no one will forget the care and attention provided by Martina, who managed the dining room. Skiing was great with perfect sunny weather six days in a row, though some wished for a little fresh snow. Most of us made our way to the Ice Q Restaurant with its panoramic views of the Alps. This place was featured in the recent 007 movie, Spectre. The 007 theme continued when many ordered martinis with lunch – shaken not stirred. We had one significant ski tumble during the trip when Lydia fell racing to the happy hour at Marco’s. Undaunted, she got around town with her knee brace and crutches the latter part of the week enjoying the cafes with others taking a break from the slopes. On Wednesday, the 25th about half the group traveled to Innsbruck. Our cozy mini-bus was driven by a delightful driver who tried to point out all the sites in his best English. Our walking tour of Innsbruck was hosted by the theatrical Luka, who provided headsets so that each of us could hear the history of Innsbruck along with a huge repertoire of jokes. (” I am Luke, Luke Sky Walker, and welcome to my tour”). Besides the historical sites, we discovered a marvelous cafe and the special way they serve hot milk, a shot of rum and a fabulous chocolate bonbon for “make your own cocoa”. On the way back to Solden we stopped at an out-of-the-way shop that must have been owned by the bus driver’s brother, but it was fun. Trip members also enjoyed a wild toboggan ride, curling and the Wednesday night expert ski show with fireworks. 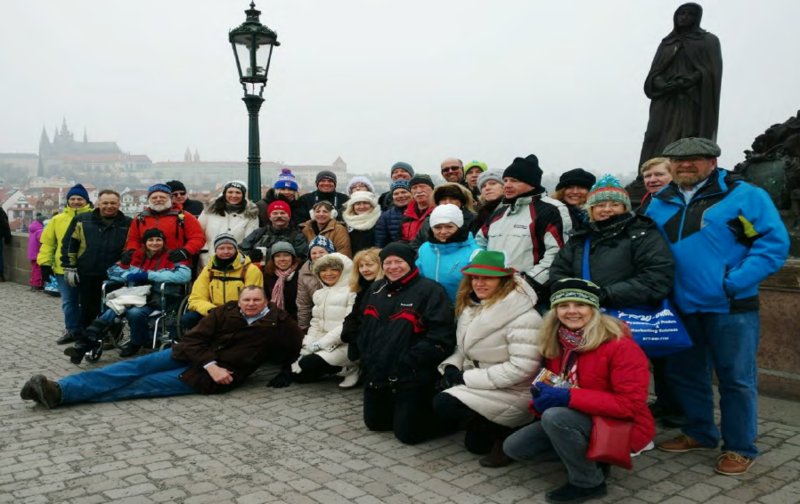 On Saturday, January 28 we traveled by bus to Prague. This was a chance for club members to learn how to “count off” vs. doing a by person rollcall. Our wonderful guide, Alexandra, joined us on the bus ride and managed the trip from Austria, through Germany and across the border into the Czech Republic. Movies were enjoyed by all – The Imagination Game and McFarlane. And during the afternoon Alexandra led a walking tour of Ragensburg, a medieval town on the Danube. We arrived in Prague on Saturday night to discover that we were booked in another great hotel – the Grand Majestic. We also had another surprise, two old friends from the MCSC trip to Engelberg, Switzerland: Melanie and her father Hans. They drove in from Frankfurt, Germany to spend time with club members. Thanks to Don Smith who kept in touch with Melanie and made the arrangements. The following night, Wayne hosted his annual group dinner at the Peklo restaurant in Prague. Located in the lower level of an old monastery, we were treated to great food and live music. Most spent our final day in Prague doing site seeing, shopping for garnets or Bohemian crystal and taking in a concert. It was a wonderful trip! And all are looking forward to next year’s European adventure.